I am also known as the Groenendael, which is the name of the village where my earliest ancestors lived. I am one of four separate breeds called "Belgian Sheepdogs" or "Belgian Shepherds", and we are all talented, intelligent and versatile breeds, even though some of us are better known than others. I am easy to spot in this photo because I am black. 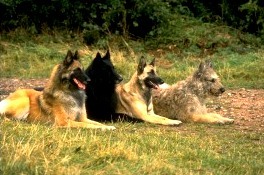 The other three dogs pictured with me are the other varieties of Belgian Shepherds. I have a very thick coat with an undercoat which requires not much more than weekly brushing to keep it looking good. I have a very good reputation as a companion dog, being eager to learn and to please, but it is important for me to have proper obedience training at an early age. I instinctively and fearlessly guard my family and their property. Exercise should be an important part of my daily routine. We have no Belgian Sheepdog Breeders listed at this time. Click here to place your Belgian Sheepdog Ad!